Inkspire Me: Merry Christmas from Stampin' Up! Yes, we do know it's only October; but, the holidays have a way of sneaking up on us all. 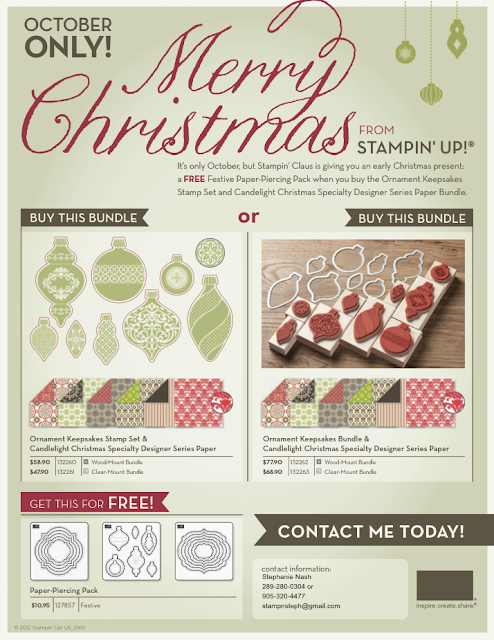 To celebrate the season of giving, Stampin' Up! is giving you this very special gift! Simply purchase either the Ornament Keepsakes stamp set with Candlelight Christmas Specialty DSP OR the Ornament Keepsakes Bundle with Candlelight Christmas Specialty DSP and Stampin' Up! will give you, at no cost, the Paper-Piercing Pack, a $10.95 value. How awesome is that? Better yet, why not purchase bundles for your paper craft loving family and friends? Then you can all benefit from this fabulous deal! Offer ends October 31, 2012. Don't miss your chance to get some great gifts for yourself and your family or friends. To book a party and see these items in action, simply email or call me, 289-280-0304, to book today!